Lake County Sheriff Bud Blair meets force with force as an international jihadist bent on revenge hires a biker gang to kill the Reverend TJ Wildish. When three members of the gang are arrested and jailed, a gang of armed bikers threaten to destroy the small town of Lakeview unless their friends are released. In Portland, a rogue FBI agent sends Special Agents Wilcox and Brandt on the hunt for a human trafficking pipeline. What they find will unleash a wave of panic. Not Before Midnight is also a love story. When Nancy Sixkiller breaks her engagement and flees to Yakima, Bud spirals into a depression that may cost him his job. But when Nancy returns, six months later, as the Emergency Services Center Director, the town is taking bets as to how long it will be before the two are married. 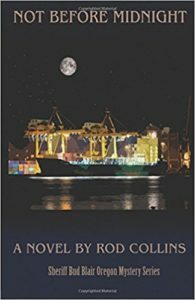 The Reverend Wildish seeks safe harbor with his old friend, retired detective Dell BeBe, who’s living in a log home on secluded Dog Lake. Dutch Vanderlin, Portland SAC sends Agent Miranda Wright to interview TJ and work the case backwards, find out who TJ talked with, and find out where the threat is coming from. BB and Miranda immediately sense an attraction, which is strongly intensified when they engage hired killers in a gun battle. The story covers the Pacific Northwest … from Oregon’s High Desert to Portland, Seattle, and Ketchikan. 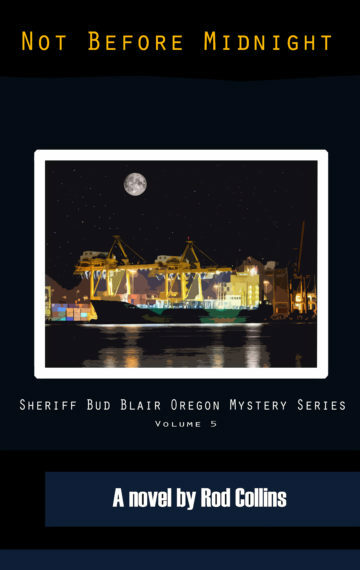 These landscapes strongly influence the character of the people living there and serve as a rugged backdrop to a realistic, page-turning novel — fifth in the Sheriff Bud Blair series.